1. Trauma healing is not one directional; it is clearly not linear. Although the diagram has arrows indicating a direction of movement, like grief stages people can jump around from stage to stage. Nothing in trauma and grief is neat and orderly, even healing from them. 2. Trauma healing is both a decision and a process. Trauma healing initially involves a choice of making the step to move out of the react/revenge cycle, yet it is also very much a process of learning to be gentle and patient with myself as I move through the journey. 3. The key is knowing that choice is available. 4. The paradox of trauma healing is that in order to forget, we need to remember. Forgetting is not possible, but in order to move on in healing we need to re-member the past. The initial and natural response to trauma results in a victim being somewhere on the inner circle of the stages of trauma. The victim may move around in this inner circle for any period of time. 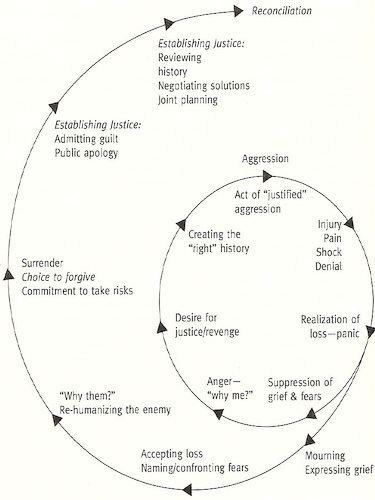 Movement to the outer circle comes as the victim realizes she has a choice to move beyond the reactions described in the inner circle. Spending some time reflecting on this diagram has been helpful for my own journey. You may also find it helpful to reflect on this model in relation to your own traumatic experience. Which stages of trauma healing do you recognize as places you have been on your journey? Where do you currently find yourself on this diagram? What do you like about where you are? What do you dislike? What other places on the diagram can you identify as places you have been since your traumatic experience? How have you been gentle with yourself for how you have processed your journey? How have you been hard on yourself? What kind of movement would you like to see for your own growth and well-being? If you are in the inner circle, do you want to move to the outer circle? What would it take for you to be able to do so?